Together with my wife Stephanie, from 9 – 12 January, we planned a 3 night, 4 day cycle tour around the south-eastern corner of Peninsula Malaysia. Our route took in the small town’s, beaches and Kampong’s (villages) of Desaru, Sungai Renggit, Tanjong Balau, Sedili Besar and Kota Tinggi. This is a brief trip report with some photo’s and information useful to anyone planning their own trip. 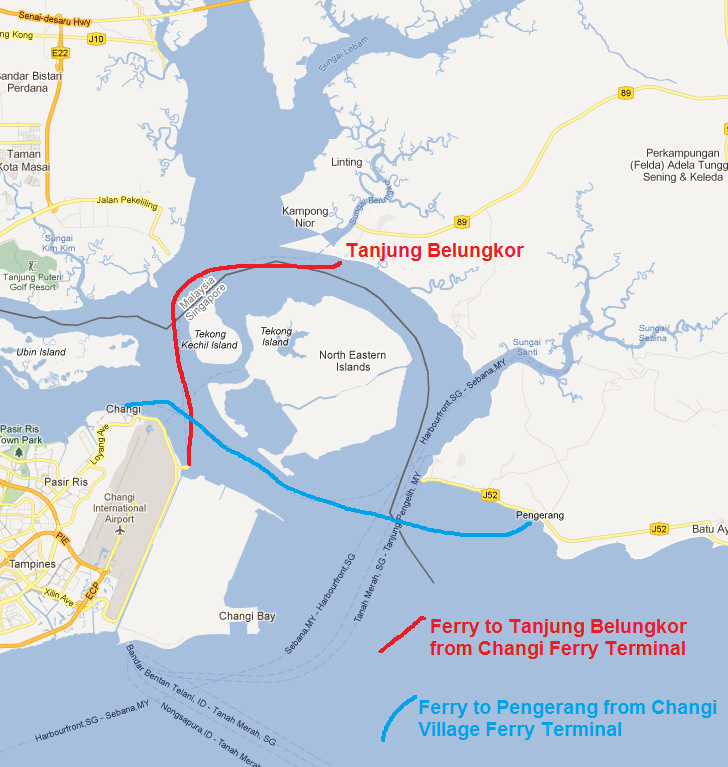 We took the 9:30am ferry from Changi Ferry Terminal (30 Changi Ferry Road), across to Tanjung Belungkor in Malaysia. The ferry cost us S$94 dollars for two people (return) including our two bikes. The ferry can be booked through Desaru Fruit Farm Tour & Travel (or call Changi Ferry Terminal phone: 6535 8686, email: sulemah@desaruff.com). The 2013 timetable and schedule is listed below. 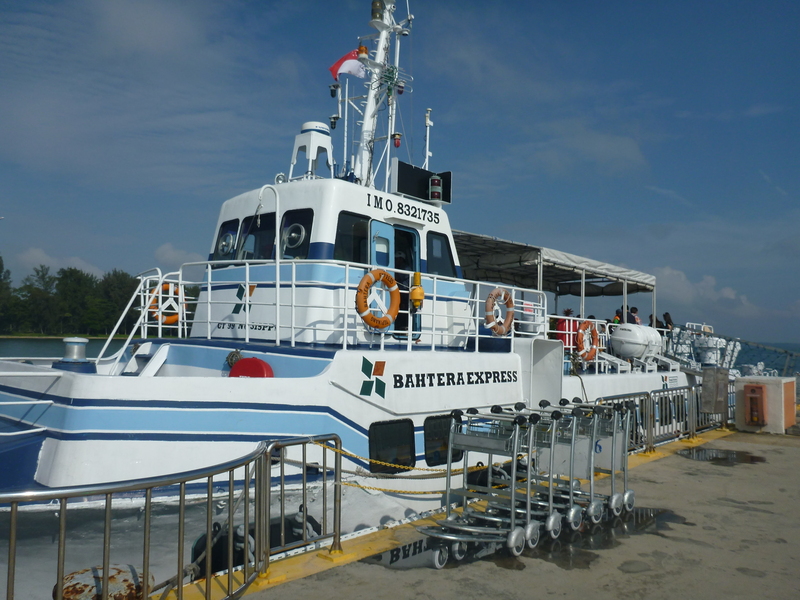 It’s a 30 minute pleasant ferry ride across to Tanjung Belungkor. Don’t confuse this ferry with the small bum boats which take you to Pengerang from Changi Village ferry terminal. Pengerang is about 7 km further east of Tanjung Belungkor. 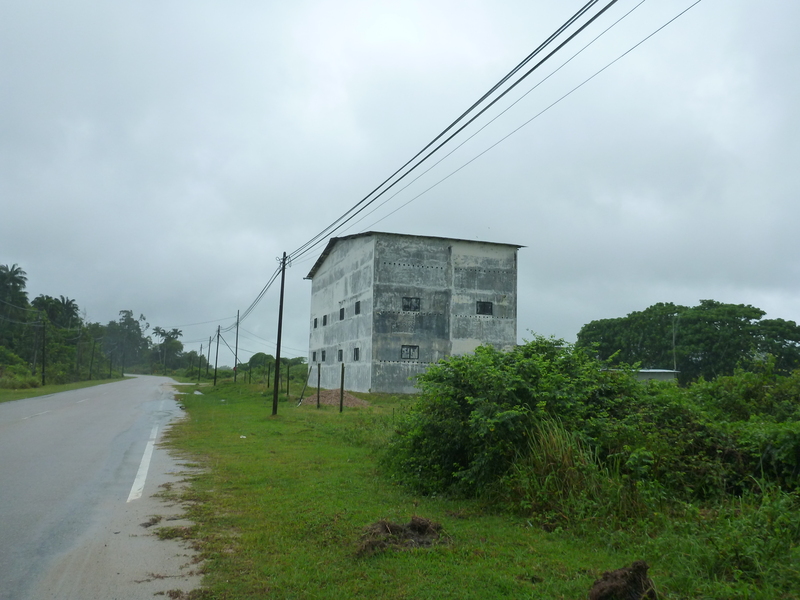 After passing through the customs check point in Tanjung Belungkor we emerged into rural Malaysia. This is a completely different world than the built up, fast paced, mega-city of Singapore. We enjoy visiting this corner of Malaysia and this is our third cycling trip here. 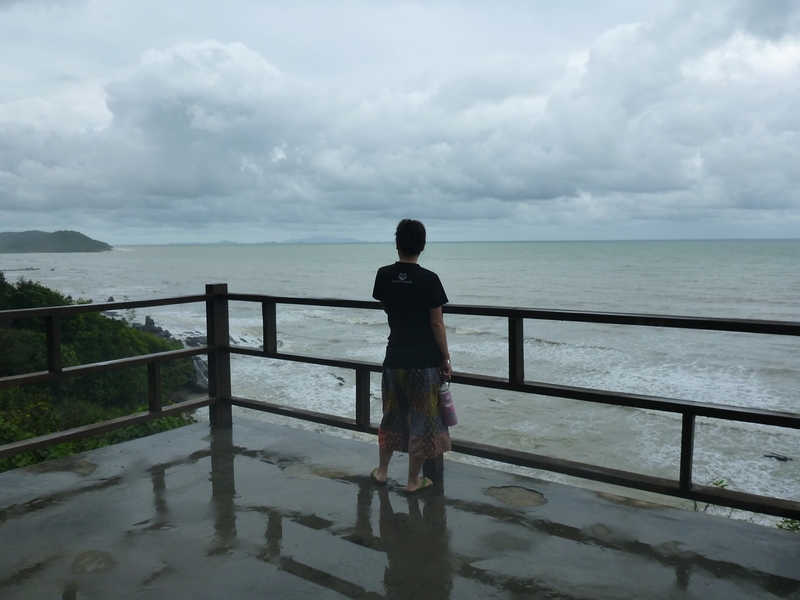 It has few tourists, some nice little local seafood restaurants, quaint kampong’s and a slow relaxed pace of life. You can make up your own itinerary from day trips, to overnight, to multi-day excursions. It’s nice for simple cycling holidays as the roads are fairly quiet and the Malaysian drivers in this part seem to be quite respectful of cyclists. The scenery does not change dramatically and tends to be dominated by palm oil plantations however for simple, down to earth, inexpensive and healthy weekends away its pretty cool. 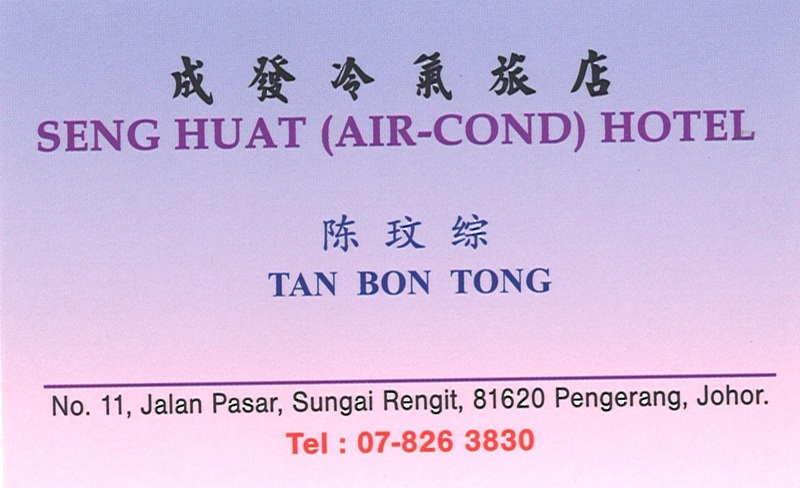 You can also come over without bicycles of course and can rent taxi’s from Tanjung Belungkor to various destinations. Click here to see the 2013 taxi pricing options available from the Tanjung Belungkor ferry terminal. We peddled off slowly taking our time and chatting away under the hot sun. For the first section the cycling is mainly through palm oil plantations. 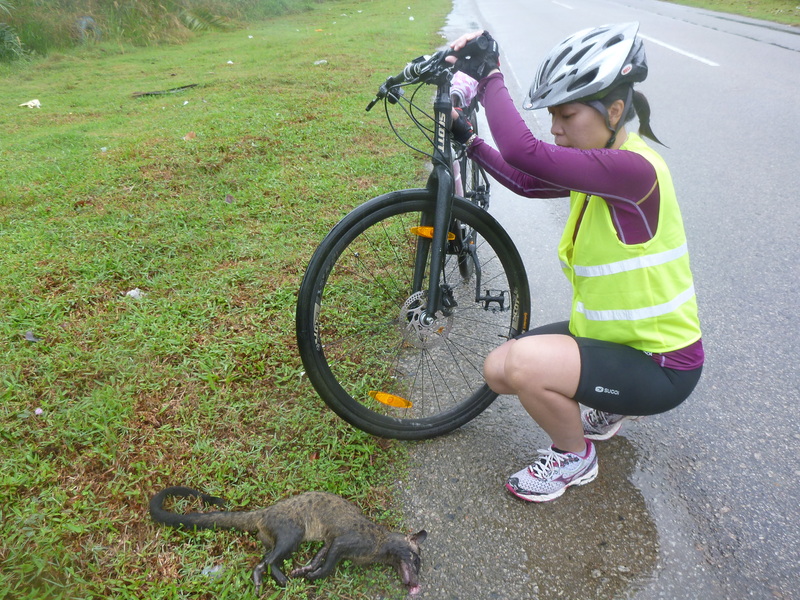 Stephanie soon noticed her first road kill – a monitor lizard. She spotted all sorts of dead things on the road during the next 4 days including snakes, a possum type creature and eels. The only thing I found was a giant spider, the size of my foot. It turned out to be a stick. 40km later we reached the seaside town of Sungai Renggit. We had stayed here before on a previous bike trip in the hotel ‘Seng Huat’. The hotel cost us 30 Ringgit for the night and is run by an older chinese gentlemen. You can book this hotel by telephone only (and it helps to speak Chinese). His name card is attached here below. On that trip we ate beautiful butter lobster at the end of a hot 70km cycle washed down with some cold beer at the ‘Beautiful Village Seafood Restaurant’ (not so appropriately named) . This is located on the street corner right beside the hotel Seng Huat. We highly recommend eating here. After a 45 min break we set off on the second leg, heading further north to Tanjung Balau. By this time, the day was scorching hot. Even with layers of sunscreen on, I could feel my skin burning under the intense sun. 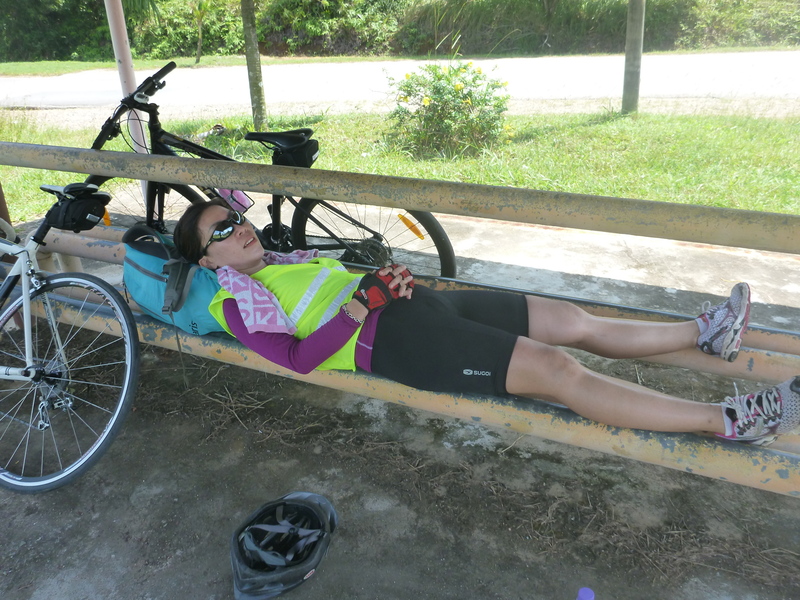 We rode slowly along the coastal road for a few km until we spied a small bus stop with some welcome shade. We lay down in the cool concrete floor and rested for 30 minutes. Finally we gathered up the courage to get back on the bikes. It must have been close to 40 degrees and the road has very few tree’s offering any form of shade. The heat was unbelievably intense and sucked the energy from us. Having a rest in the shade on day one – it was super hot and sucked the energy from us. Slowly we ground down the km’s. 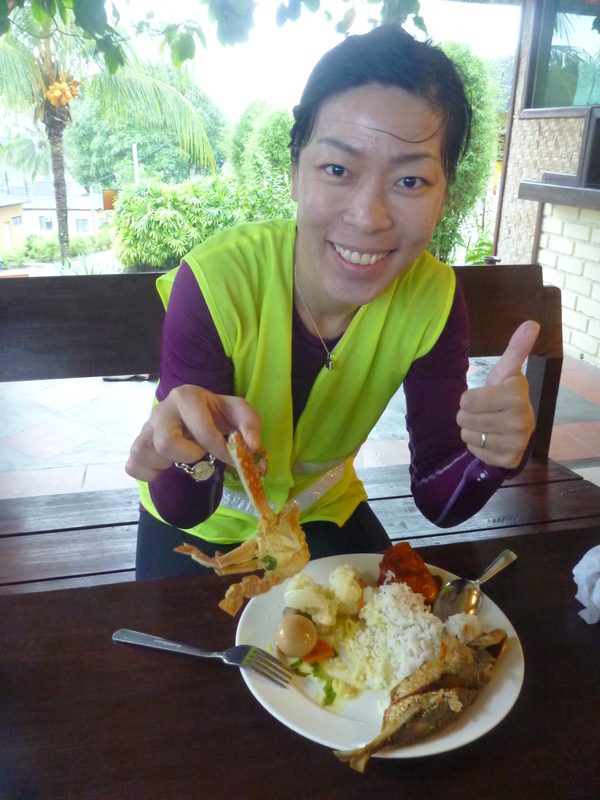 Stephanie was getting a very sore backside and we were both glad to arrive at the Pelangi Balau Resort located 5km north of Desaru in the small seaside kampong ‘Tanjong Balau’. 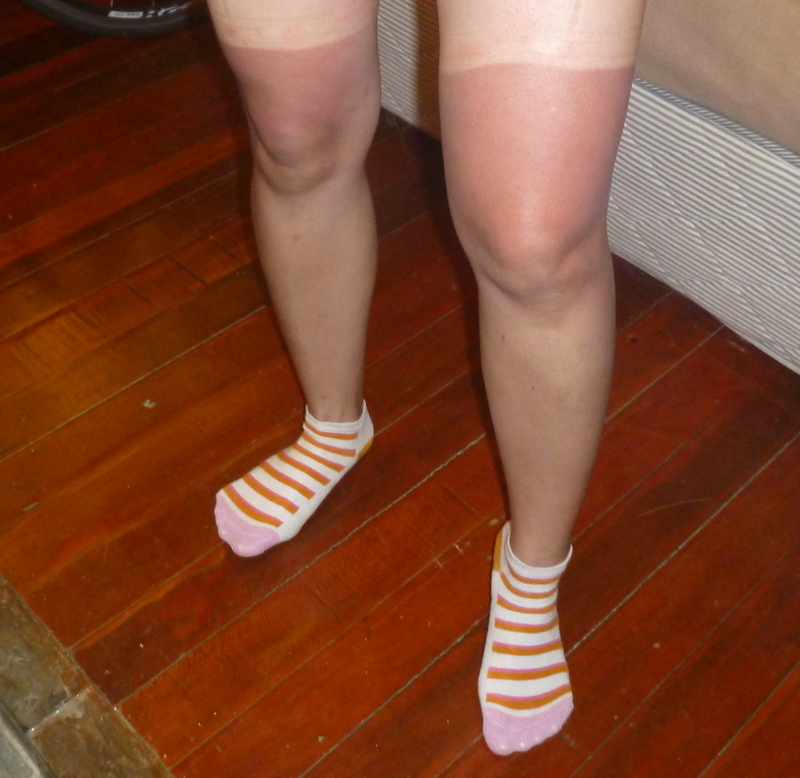 We felt like we had been in a toaster all day and both had wicked tan lines. My bum felt like Mike Tyson had been using it as a punching bag. We both got burnt to a crisp on day one. Nice tan lines. Pelangi Balau is a small resort right on the beach which has seen better years. The staff here appear tired and disinterested. It cost us 150 Ringgit for a double room inclusive of breakfast. It seems to cater mainly to local Malay families, I was the only white guy there and there were no Singaporean cars that we could see. We left the resort and walked 200m to some food stalls for dinner. We ate some basic mee hoon soup and nasi goreng for dinner. We slept ok until midnight although I could almost count the individual bed springs pressing into various parts of my body. It wasn’t the most comfortable mattress I have slept on. We were woken by a noisy group of youngsters having a party in the corridor from around 1 am. I finally got up and summed up all the charisma I could muster (at 3am with a sunburnt body and lacking sleep) to ask them if they would mind moving away to some other spot. To their credit they were quite polite to me and left immediately. We woke again at 7:30am to heavy rain. The breakfast in Pelangi Balau looked as interesting as the staff were interested in their jobs. Fueled up on some mee goreng and black tea we then rested in the room, hoping the rain would stop. To no avail, we finally accepted the fact we would be getting wet backsides and checked out. I let the staff know that it may be a good idea to get their security guard to take a walk during the evening to keep the noise levels down so guests can sleep. They seemed as interested in my feedback as I was interested in their breakfast. Our sunburn was raw and painful to touch this morning, so the heavy rain was almost a blessing. The 1st 10km was flat and smooth and we made good time. It then starts to become a little more rolling, but the road follows the coast all the way. There are no towns or villages at all for the first 30km until you reach Sedili Kechil. A large bridge leads you into Sedili Kechil crossing a river mouth leading to the open sea. 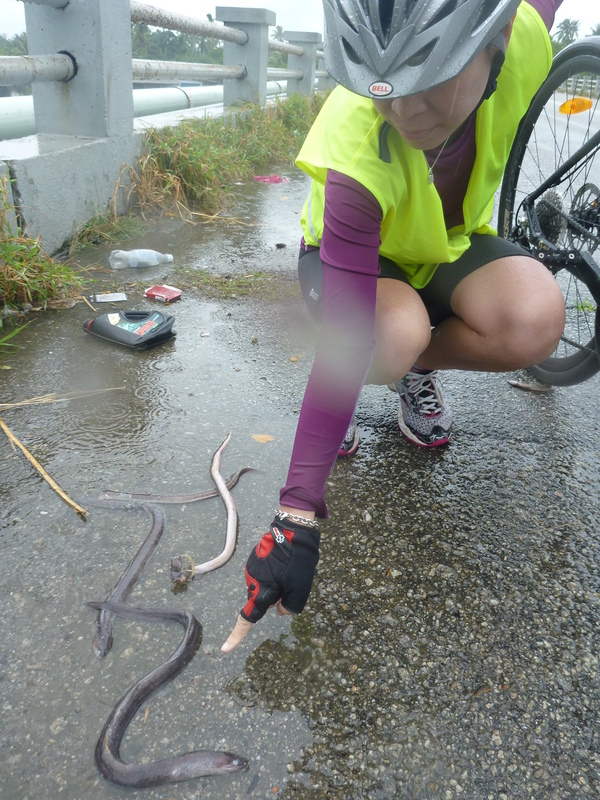 Here Stephanie spotted a large number of dead eels on the side of the bridge. The mystery was, how did they get there? We could only think that people had been fishing on the bridge and dumped them there. Dead eels on the bridge leading in to Sedili Besar. 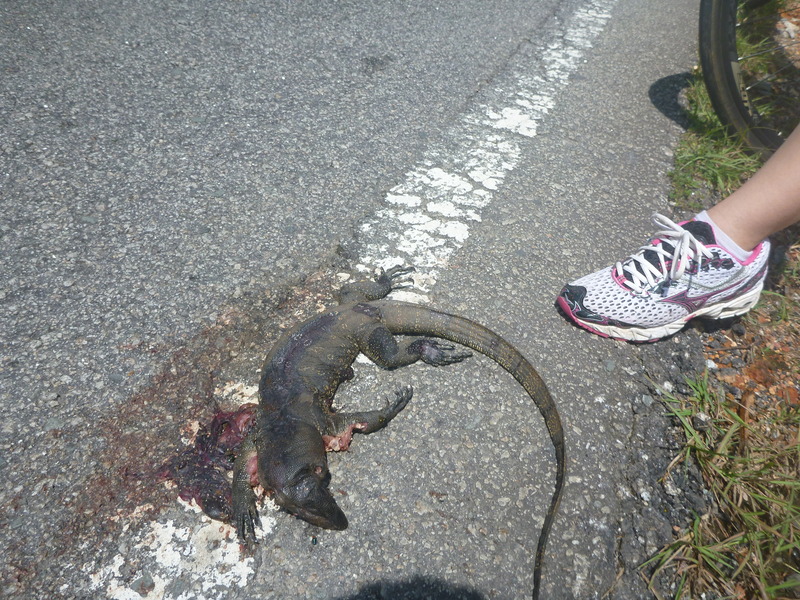 2km later Stephanie also spotted this dead possum or cat-like animal on the side of the road. Does anyone know what this is? What is this animal? It looks like a cross between a possum and a cat. The further north we rode and the more rural the setting, the friendlier people seemed to become. Groups of young children would invariably always shout out cheerful “helloooooooo’s” to us as we cycled past, in a genuine and friendly manner. We cycled on without stopping until we reached Sedili Besar and asked for directions from a young chap. I can speak basic Malay and he told me that I needed a motorbike to reach Tanjung Sutera resort and it was back the way we had come from. From previous experience I have learned that asking for directions in this country can be a counter productive exercise – that is if you actually want to find the destination! We decided to ignore his advice and continued following our noses until we found some signs pointing us in the right direction. It was raining hard now and the final stretch into the small resort involves a steep climb and then follows the ridge-line of a Peninsula for 4km. 49km after leaving that morning, we arrived at the Tanjung Sutera resort. This cost us S$150/night inclusive of 2 lunches, dinner and breakfast. After the previous nights fiasco at the Tanjong Bulau we did not have high expectations. However we were happily greeted by a friendly receptionist named Syed and were just in time to sample a delicious buffet lunch, including ikan bakar (fried fish), crab in coconut sauce, tempet (fried beancurd) and spicy chicken in chilli sauce. I found a jar of condensed milk and must have been lacking sugar as could not resist a few big spoonfuls. Syed even helped us with taking our bikes to the room in the rain. Nice chap. 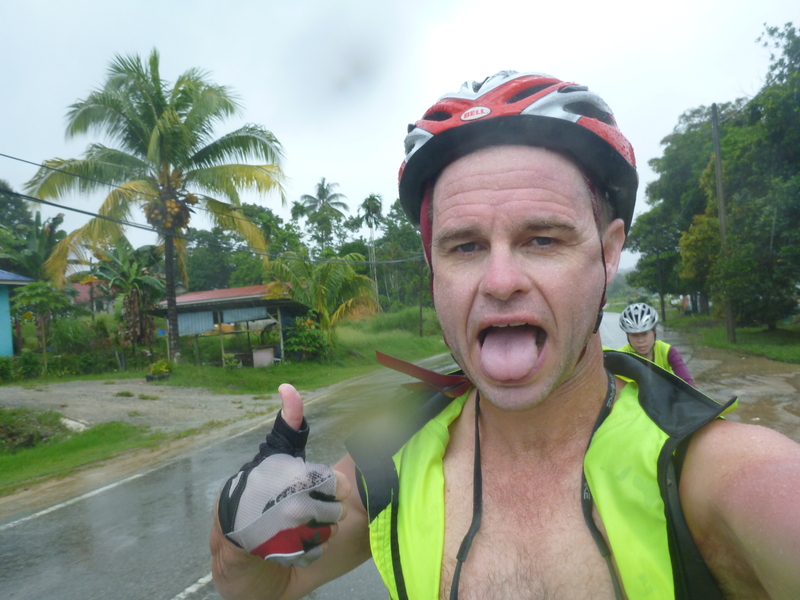 I don’t often get to say this in the tropics, but after being wet for over 3 hours on the bikes and finally stopping, we were feeling cold. The small bungalow we slept in was basic, but clean with plenty of space. Stephanie and I have fairly modest expectations for our rooms when we travel. All we expect is that they are clean, have a comfortable bed, a heated shower and are peaceful enough to sleep in. Aircon is also a bonus. This room had it all and we appreciated warming up under the shower and having a rest. Dinner that night was also delicious, I had a beer (8 Ringgit/can) with cereal prawns, assam fish(spicy fish), brinjol (eggplant), mixed vege. Meanwhile the rain continued to pour down as he hit the sack for an early nights sleep. 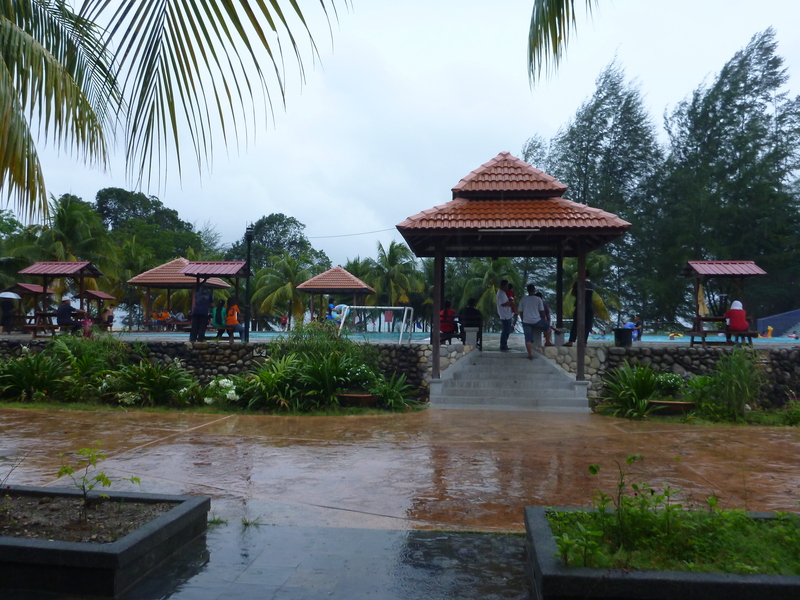 The Tanjung Sutera resort is quite remote, with no shops or villages for a few kilometres. The rooms are clean and basic, but spacious and the food is excellent. We recommend this place to stay and the details are here. 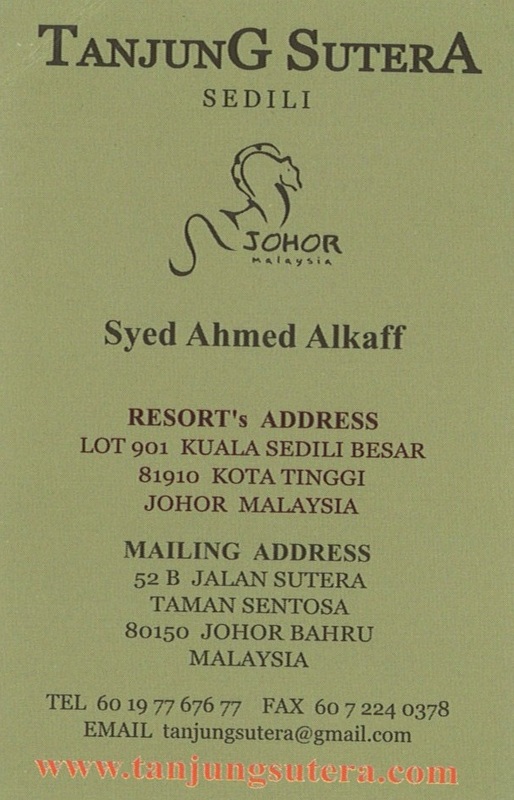 Contact Syed from Tanjung Sutera to book your stay (click image to enlarge). It rained most of the night but stopped for a brief period while we had breakfast. We got to enjoy the nice view from the resort dining area this morning, overlooking the rocky coastline and the ocean. Today’s route heads inland to the town of Kota Tinggi. Kota Tinggi means ‘high town’ in Malay so I was a little concerned we may have some stiff climbs. One of the joys of cycling holidays is you burn lots of calories so can eat well. 5 donuts, 3 pieces of toast and a bowl of lontong later we were ready to depart. Just as the rain started again. More cycling in the rain on day 3. Today is a shorter day, just over 40km. The first 15km flew by and we sailed along at 23km/hr. Stephanie seemed to be getting her cycling rhythm today and sat hard on my back wheel the whole ride. After 15km the climbs began. Nothing major though and compared to the Coromandel cycle tour we did in New Zealand in 2011 these hills were mere bumps. Cycling past these birds nest factory’s. They are built specifically for birds to nest in. The nests are harvested and are delicacies in Chinese cuisine and also used as remedies in Chinese medicine. 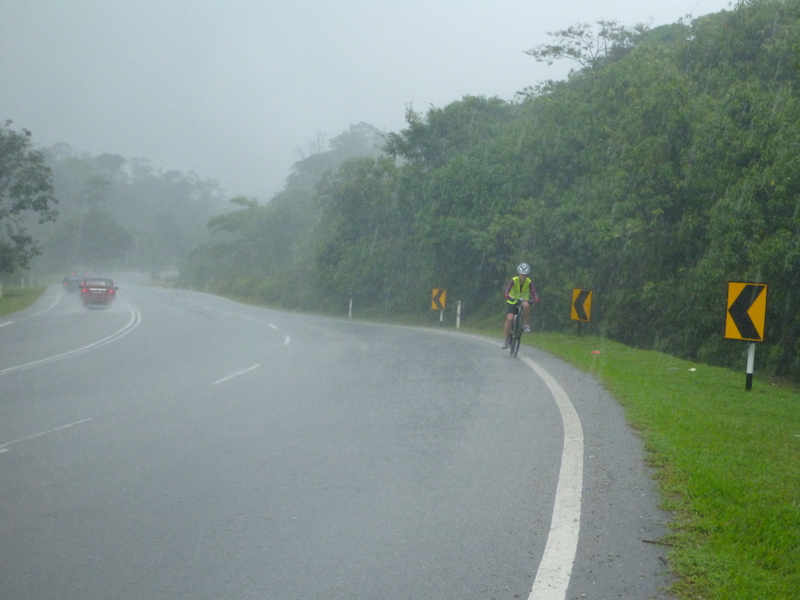 The rain got stronger for the two hours we rode, getting to the point it was hard to see and the large drops stung our skin. We still managed to average 20km/hr and pulled into Kota Tinggi completely soaked to the bone. 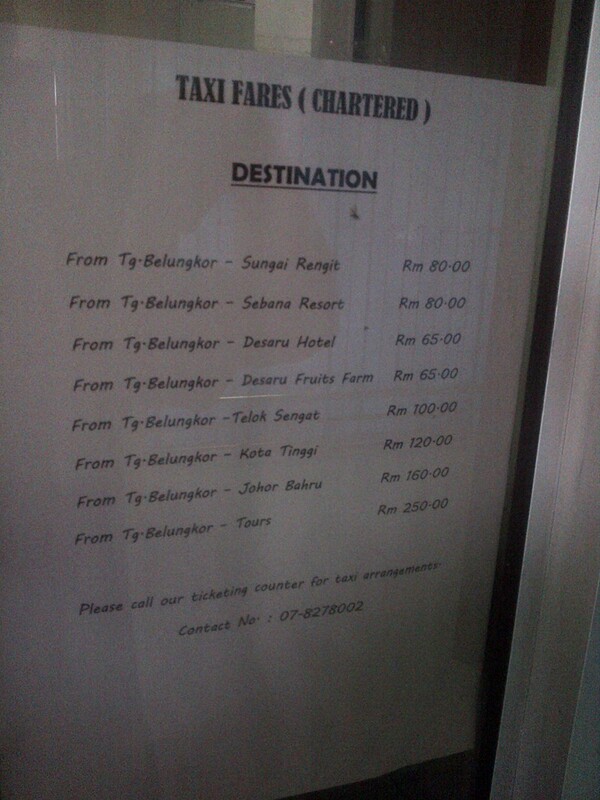 We had booked the hotel ‘Mayres‘ which proclaims itself to be the only ‘business’ hotel in Kota Tinngi. I was a little suspicious of this description and skeptically wondered if they were counting the world’s ‘oldest business’ in their description (I.e. 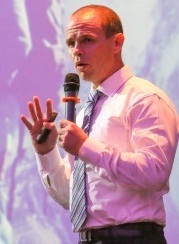 prostitution). Once we reached the centre of Kota Tinggi I had to pull out google maps on my blackberry locate the hotel which turned out to be 1200m away. The hotel Mayres turned out to be just fine, for 116RM per night for a double room (not including breakfast). 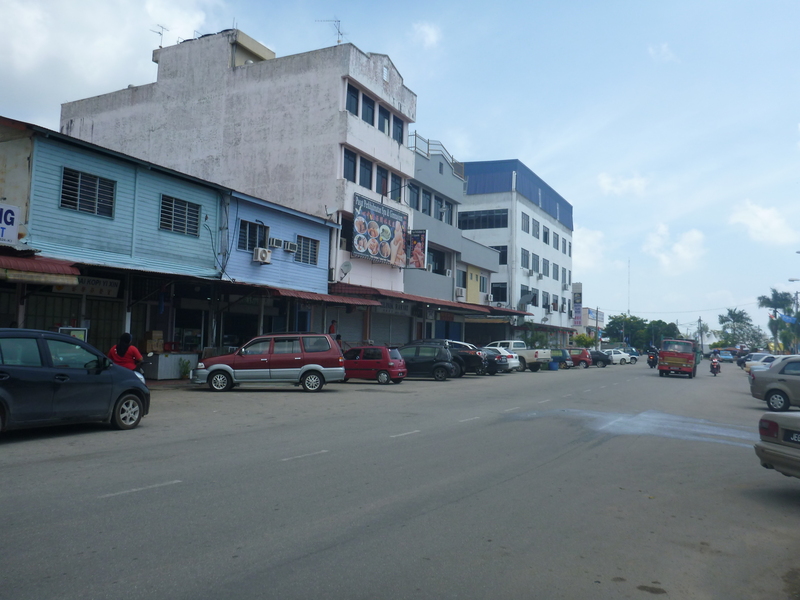 The room was spacious and clean and even had a decent view of the bustling metropolis of Kota Tinggi. We could only check in at 2pm so had an hour to kill. 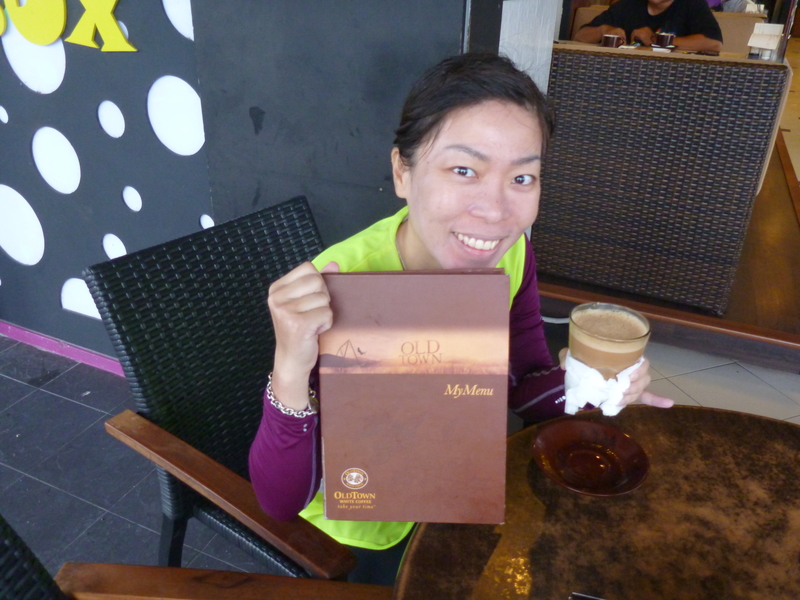 We peddled back down to the ‘old town’ coffee shop and filled up on The Tarik, noodles and roti prata. Kota Tinggi’s drainage system was overflowing in the heavy rain by now, so parts of the main street were flooded. We were both getting a little cold by now, so were happy to get to the room and get our of our wet cycling gear and warm up under the hot shower. That evening we ventured next door to the Chinese restaurant ‘Korfu’. We had black pepper crab, cereal prawns and scallops with broccoli. 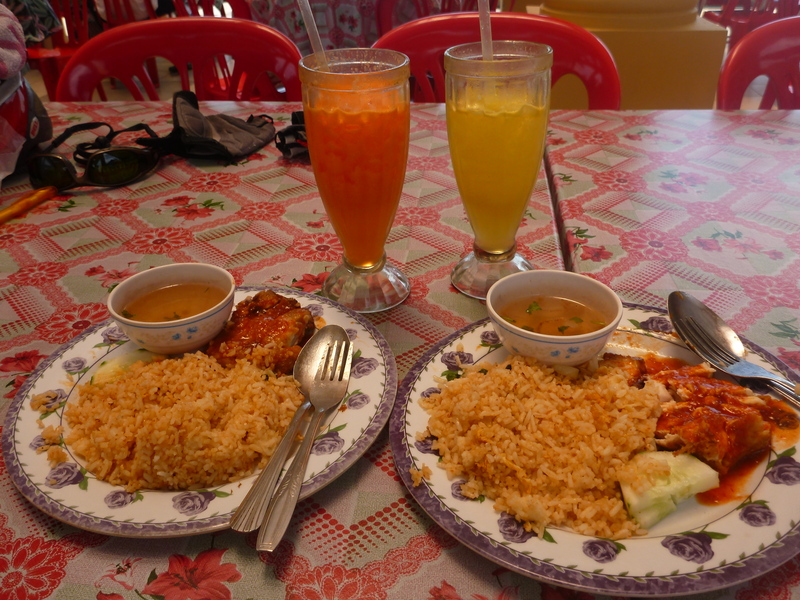 Very nice food and together a bottle of Tiger beer cost 70 Ringgit. Stephanie has a head cold this morning from being wet for the last two days. We walked across the road from the hotel and had Roti Canai (Malaysian version of Singapore’s ‘Roti Prata’) which was delicious, washed down with the Roti Canai’s compulsory companion – a mug of hot, sweet, smooth and frothy ‘teh tarik’ (tea sweetened with condensed milk, evaporated milk and sugar). 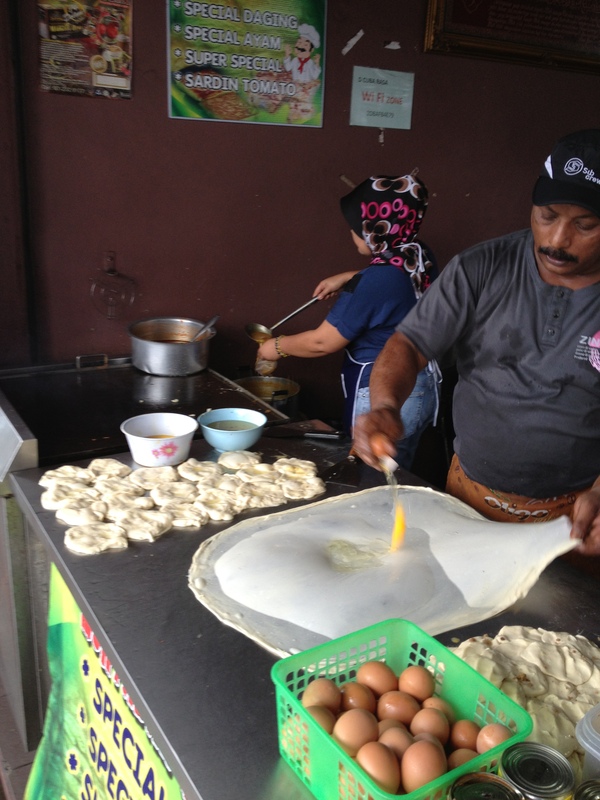 Roti Canai being made in Kota Tinggi – delicious! We set off at 9:15am on the bikes. 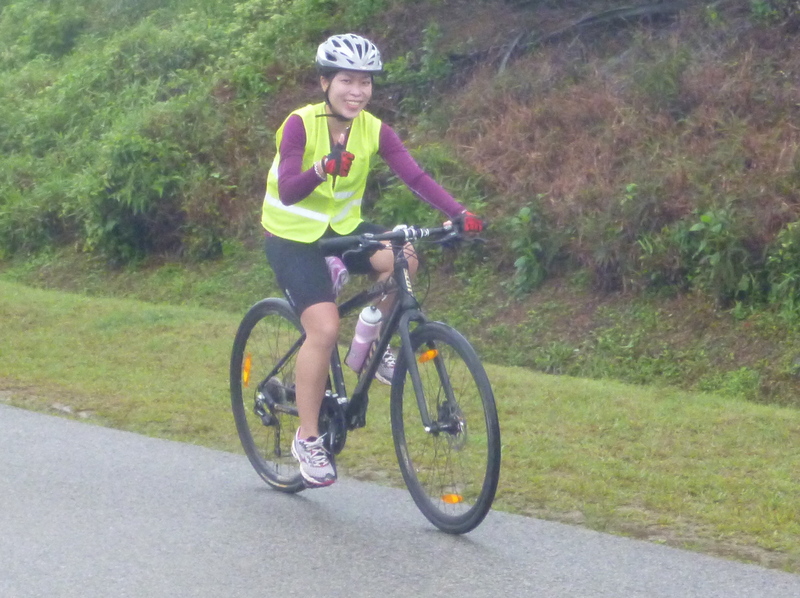 It was overcast but not raining so perfect cycling conditions. Well that is until the heavens opened up after 45 minutes and we were nearly drowned for the next two hours. It rained so hard the rivers over flowed their banks and spilled across the road. By now we were quite used to cycling in the rain, however I was uncomfortable when it gets so heavy that its hard to see more than a few metres. And this morning the route on road 92 which we were travelling had almost no shoulder to cycle on. Traffic was the heaviest we encountered so far and the cars splashed torrents of water over us as they whizzed past. The drivers by and large were respectful however and gave us room as we snuck along the verge in the pouring rain. At the top of one hill I stopped to allow Stephanie to catch up. It was raining so hard and was getting dangerous with the speeding cars and lack of visibility. I was concerned she would be nervous and miserable. To my delight as she approached I saw a huge grin on her face. This was the grin of someone who was enjoying the pure pleasure of the adventure that only comes from throwing yourself headfirst into unpredictable and trying situation’s, and learning you can not only cope but thrive. It lifted my spirits to see this change in her. At the end of the day however she told me she actually wasn’t smiling at all but grimacing due to her bum hurting so much! So much for my theory. We rolled the last few km into Tanjong Belungkor at 2pm. We had ridden 70km for the day, 260km in total for the 4 day trip. We took the 3:30pm ferry back to Singapore and were happily back enjoying the comforts of home by 5pm. Our aching bums and sunburnt limbs the only physical reminders of a fun, healthy, reasonably environmentally friendly, low-cost way to spend some quality time together. 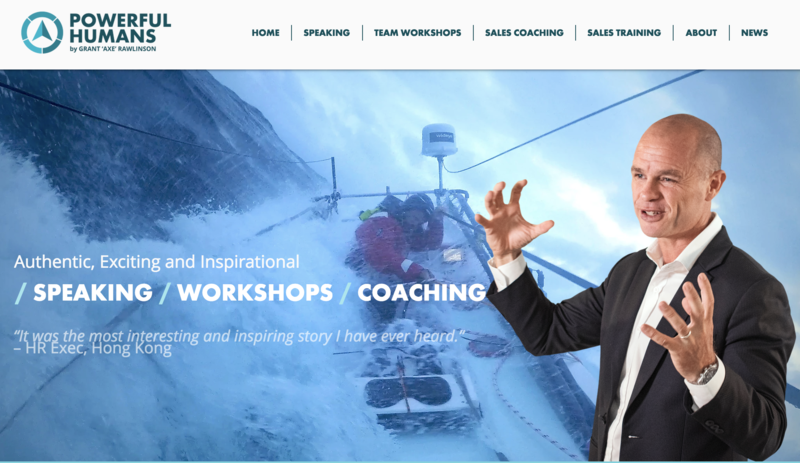 For me this trip also proved that I don’t need to spend $100,000 and travel to the most extreme places on earth to have an adventure – you can do it from home in a few short days and not very much money. The whole trip cost us S$220 each! We made this short video of the trip – Enjoy the video and thanks for reading!